BigWetFish.hosting is a UK registered company specializing in self- and fully managed hosting services. The company with such an intriguing name has been in the industry for many years. £4.49/month, £10.99/month, and £22.99/month are the monthly prices for 3 shared plans offered by the provider. They are available for a purchase monthly, and also for 1 and 2 years. The table above demonstrates the prices for a 24-month period and in the US dollars. The company also offers a variety of services, including multi-site hosting, WordPress hosting, and Weebly Site Builder. As to the servers offered, the list of available options features self- or fully managed VPS, dedicated server hosting, and high availability clustered solutions. Free reboots, migration from current hosts, CPanel license, powerful servers, and other advantages make BigWetFish, which is often abbreviated as BWF, a company which is capable of providing hosting services to any website regardless of whether it’s a personal page or a large site with large traffic. The company takes pride in its fully certified support team that is available 24/7. You can contact them by phone (sales number is available at the bottom). And existing customers can open a support ticket for sure. 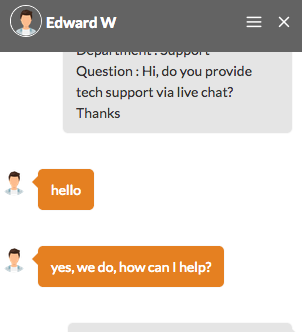 We have found that their support live chat works fine, you can get some basic tech help via a live chat. 4.4 HRank and #137 are the results for BigWetFish.hosting in 2018. Unfortunately, the provider’s uptime chart didn’t look bright in 2018. It stayed most of the time below the 99% line: mostly in the range of 95%-98%, and there was a case of 84% downtime in December. Very unstable it was. Less instability on the response time chart, however, only average results: ~800ms. Yet, by some interesting algorithm, the provider increased the number of domains at the end of the monitoring period (compared to the beginning numbers) even though the growth trend was not at all stable.